Can I Get A Foul Here Maybe? Our Hands Have Fingertips, But Our Toes..
Grandma! 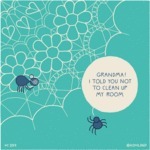 I Told You Not To Clean Up My Room.